Detached house in Cabris; Maritime Alps. quiet house, sea and Provencal village. 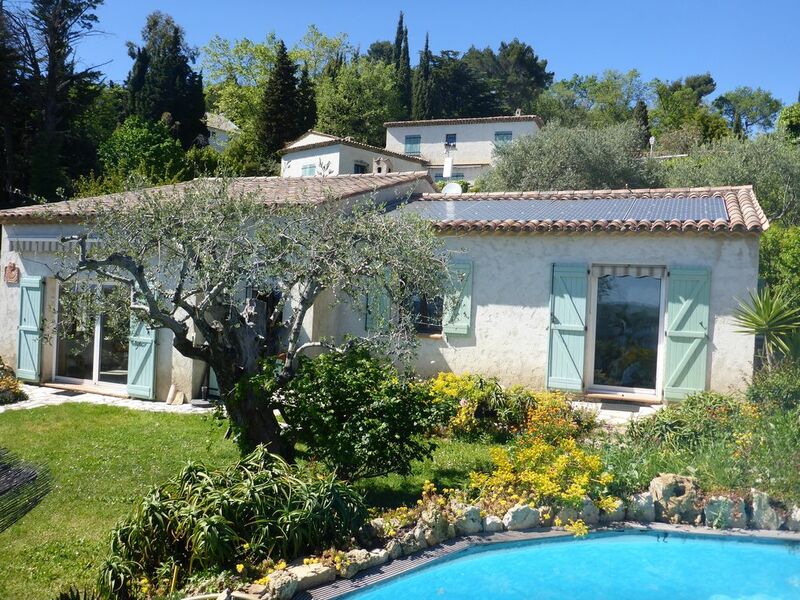 House in a subdivision not overlooked, with stunning views over the bay of Cannes, the Lerins Islands, the Tanneron mountains and the village of Cabris. Located on the hillside, it enjoys a Mediterranean climate with its fresh 560 m.
Used the rest of the year by its owners, it enjoys all the comforts of home personal '. Ideal for couples with young children seeking sun, without the rush of the sea. An above ground pool built in the garden will allow you to cool off while enjoying the surroundings. Benefit from the climate of the Riviera without the world of the seaside and stifling heat: here there is always a refreshing breeze that allows for restful nights. -to 25 minutes from Cannes and the sea and the many coves of the Esterel. 130m2 house on 1200m of land planted with olive trees. Pool "above ground" 6m in diameter; 1.30m built deep into the ground (wooden terrace) protected access. 3 rooms equipped with a TV, bed or sofa bed for 2 people. Baby bed, high chair on request. American Kitchen, comfortable fridge, oven, microwave, freezer, dishwasher, washing machine, dryer. 1 bathroom with bathtub, 1 shower. Terrace with outdoor tables, chairs, umbrellas. Covered shelter for car, table tennis and boules. Price: 1450 Euros per week. Free from 16 July to 30 August. shower in the laundry room where is washing machine, dryer and freezer. Bathroom redone: bath and shower, sinks, towel dry. Separate toilet with washbasin. You will find all the amenities of a modern home, used throughout the year by its owners. Mobile nets are installed on the windows of the rooms. All the basic ingredients (oil, salt, pepper, vinegar) are at your disposal as well as the laundry for washing machine and dishwasher, toilet paper ... On arrival refreshments will be in the refrigerator.